Chicago's tough gun law was supposed to help officials track who's acquiring guns and who's misusing them. So far it's doing neither. Edison Park and Norwood Park are seemingly as far from Chicago's crime problems as one can get without leaving the city. The predominantly white, middle-class neighborhoods are on the far northwest edge of Chicago, about 14 miles from downtown, with spacious homes and leafy streets that give off a suburban feel. Together they make up a big chunk of the 16th police district, whose crime rate was the lowest in the city even before the numbers started dropping citywide more than a decade ago. Still, residents say there's a widespread feeling in the community that citizens need to be ready to defend themselves against criminals—one reason why the neighborhoods are among the city's leaders in gun registration rates, according to police department data. "Law-abiding, God-fearing, taxpaying people should be able to carry a gun," says Jim Evans, a longtime Norwood Park resident who was hanging out with friends George Lopez and Joe Stanek after coaching a youth baseball game at a neighborhood park last week. Evans says he owns "a few" handguns and rifles that he's registered with the city under its year-old gun law, and while carrying a firearm outside of the home is illegal in Chicago, all three men argue that it shouldn't be. "If you've seen the news lately, they're wilding downtown," Evans says, refering to a rash of highly publicized attacks by groups of teens. "You're either going to be a sitting duck or not. Give people the choice." Last July, after the U.S. Supreme Court ruled in favor of a challenge to Chicago's 28-year-old ban on handguns, city officials drafted a new law that allows handgun ownership under strict conditions. To comply, gun owners must acquire a state firearm-owner identification card, undergo three background checks, take a training class, practice shooting at a range, pay $100 plus $15 per gun, and register with the police department. Registrations started last July 12. 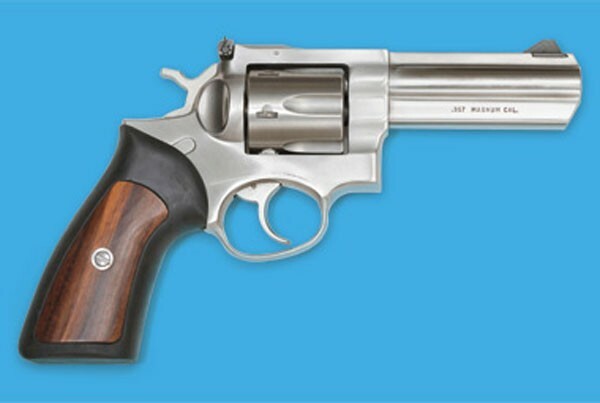 •Since the law went into effect last July, 3,153 people have applied to register a firearm, and all but 68 of the applications have been accepted, a rate of about 98 percent—meaning the law isn’t weeding out too many potential gun owners. Police department officials say that number could climb because some of the unapproved applications are still being processed. •Through the end of May, the registrations cover a total of 11,239 firearms (about 3.6 per applicant). Of those, 7,490 are handguns and 3,749 are long guns. •The registration process appears to be involving just a fraction of those who actually own guns in Chicago (see "City's gun law has little firepower"). According to the state police, 116,173 residents of Chicago have state-issued firearm owner identification cards. Even considering that not everyone with a card owns a gun—and that some gun owners, including active police officers, are not required to register with the city—there's still a wide divide. 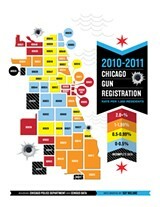 •The highest concentrations of gun owners who have registered with the city are in white, working- and middle-class areas on the edges of the city—neighborhoods including Norwood Park, Edison Park, Forest Glen, and Jefferson Park on the northwest side and Mount Greenwood, Beverly, Garfield Ridge, and Clearing on the southwest side. There are also some relatively high rates at downtown zip codes, including those on the near west side, though numbers in the Loop are somewhat skewed by smaller population totals. •The lowest rates of registered gun owners are in economically and racially diverse areas on the far north lakefront—Rogers Park and Edgewater—as well as in some of the highest-crime parts of Chicago, including Englewood and East and West Garfield Park. Predominantly Latino neighborhoods like Little Village and Pilsen also have relatively low rates. The trend is similar to what researchers have found about gun ownership nationally: white, middle-class people tend to have the highest rates while Latinos have the lowest. The primary motivation for acquiring a gun, studies have found, is for sports and recreation. But observers in Chicago say there are other factors at work here: More convicted felons—most of whom can't legally own guns—live in south- and west-side neighborhoods, according to the Illinois Department of Corrections. There's also a higher level of distrust of the police in black and Latino communities, which means fewer people there are willing to register a gun with the CPD. More retired cops live on the northwest and southwest sides. And concerns about racial change, especially on the diversifying southwest side, has also accompanied anxiety about safety, some residents say. John Lott, an economist who argues that gun control laws like Chicago's actually lead to higher crime, says the cost of meeting the gun application's training and registration requirements essentially discriminates against low-income black communities. In Chicago, the training and permit fees cost about $250 on top of the price of the gun. "Those who are most likely to be victims of crime benefit the most from owning guns, and unfortunately, that is one very well defined group in our country, poor blacks who live in high crime urban areas such as Chicago," Lott wrote in an e-mail. "But these white, middle class areas can much more easily afford the fees to register their guns and to go through the training requirements." Roderick Sawyer, alderman of the Sixth Ward, is skeptical of that theory. "It's like buying a car," he says. "If you want one you'll find a way to do it." Sawyer's south-side ward includes struggling, high-crime areas in Englewood as well as middle-class parts of Chatham where residents are openly talking about getting guns because of crime concerns. He says it's appropriate to have "reasonable restrictions" on gun ownership in the city, though it's also clear that many people aren't complying with the law. He recalled an evening when he offered to walk a senior citizen home after a community meeting. "She moved her coat to the side and showed me she was packing," he recalls. "She said, 'How about if I walk you home?'"